Latin America continues to be the most violent region in the world for those exercising the right to defend human rights. In addition to the growing number of killings of human rights defenders, misuse of criminal justice systems and the media to criminalize and stigmatize their struggle is on the rise. Defenders of the environment and leaders of Indigenous Peoples defending the territory, environment and natural resources face a particularly grave situation because of their work. From Honduras to Paraguay, as well as in a number of other countries throughout the region, Amnesty International has documented emblematic cases that highlight the alarming tendency of state agents and non-state actors, such as companies, to try to silence community and Indigenous leaders and to give precedence to the economic interests of the few, to the detriment of human rights. Although violence against defenders is a constant in the region, little is known about what is actually happening in Chile, especially in relation to the historical context of criminalization and stigmatization of the Mapuche and their leaders. 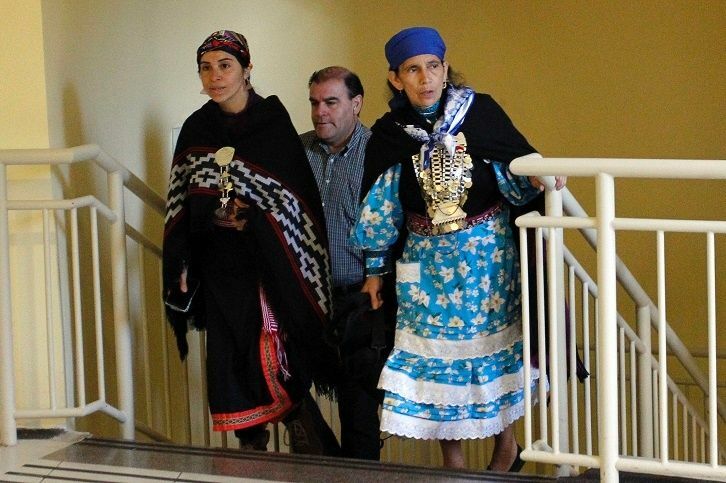 The experience of Francisca Linconao – a machi, or traditional Mapuche leader, from the Temuco area of southern Chile – is a clear indication of what is really happening on the ground. On 4 January 2013, Werner Luchsinger and Vivianne Mackay, an elderly couple, died in a tragic incident. Their house was attacked and burned by unidentified individuals who entered their property. The Luchsinger-MacKay family owned lands which were the subject of a dispute and were claimed as Mapuche ancestral territory. As a result, the couple’s deaths were automatically linked to this dispute. Machi Francisca has been prosecuted three times in connection with these terrible killings. However, all the legal proceedings have been challenged not only because of the clear lack of due process and unjustified pre-trial detention, but also because of the lack of evidence to support the allegations. In the first proceedings in 2013, Machi Francisca was charged with and acquitted of illegal possession of weapons. The alleged evidence was found in her home during a search and was challenged on the basis of the way in which the raid was carried out, including the arrival of 30 carabineros (police officers) and a number of civilians, who did not identify themselves or explain the reasons for the raid. During the search, evidence was supposedly seized from a location in the house where only the police entered and which the owner was not allowed to access, in breach of Chilean law. The acquittal in this trial was due, among other things, to the fact that the carabineros were unable to state in the indictment where exactly the alleged evidence had been found or to demonstrate that it actually belonged to the Machi. Despite the acquittal, in 2016 Machi Francisca, along with 10 others, faced terrorism-related charges of arson resulting in the couple’s deaths. The charges against the Machi were based on the testimony of another person, also charged in the case, who later retracted his statement. He accused the police of having pressured him and filed a complaint for unlawful coercion, which the Prosecutor’s Office never investigated. Also, during these proceedings, further alleged evidence gathered during the disputed 2013 raid was presented. The Machi was again acquitted at the end 2017 in a ruling which concluded that evidence presented by Prosecutor’s Office was riddled with flaws. However, in contravention of international standards, the Machi is again facing a second trial for the same incident and on the same charges, under Chile’s controversial anti-terrorism laws. The situation in which Francisca Linconao currently finds herself cannot be understood in isolation from the context of her historical struggle for recognition of ancestral territories. In 2009, in a historic judgment, the Machi won a victory in court against a company to stop the felling of a native forest that also threatened the growth of medicinal herbs and affected a sacred spring. The court not only ruled in favour of the Machi but also applied the provisions of International Labour Organization (ILO) Convention No. 169, the first court in Chile to do so. Is it a mere coincidence that Machi Francisca is today being criminalized by the justice system in Chile? Or it is a kind of reprisal for her struggle in defence of the territory and the environment, as she herself affirms? The fact that she has been taken to court three times, and acquitted twice, in connection with the horrific killing of the Luchsinger-MacKay couple not only calls into question the discriminatory way in which the justice system is used against Indigenous leaders, but also violates the rights to truth, justice and reparation for victims of crime and their families. It is imperative that a prompt and impartial investigation clarify the facts and that those responsible for these terrible killings be brought to justice. The Chilean authorities have an obligation to guarantee conditions that enable human rights defenders to carry out their work and to establish protection mechanisms for environmental defenders and Indigenous leaders who face constant criminalization and stigmatization, as well as multiple forms of discrimination because of their race, gender and leadership roles.